A "Spiritual Bouquet" is a gift of prayer or some other devotional sacrifice for another's intentions. This gift is given to another usually by giving them a card describing the sacrifices the giver will be making on the recipient's behalf. 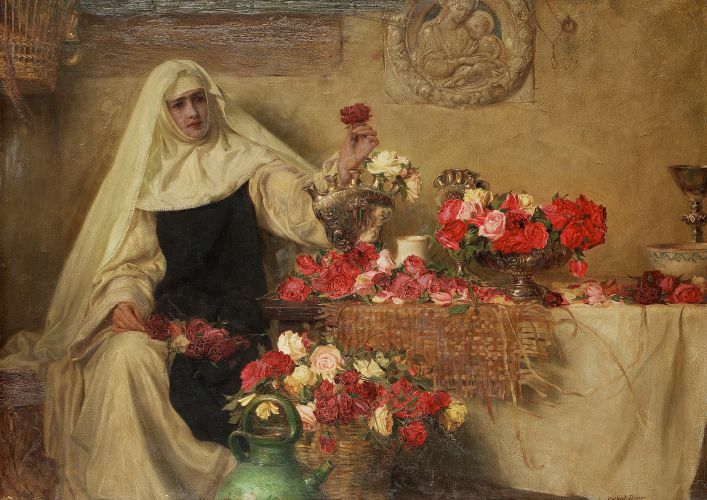 The sorts of sacrifices that can be offered to God for another are endless -- from performing specific good deeds and services; praying certain prayers, Novenas, the Rosary, or Litanies; making certain votive offerings, such as the lighting of candles; offering Masses; making the First Saturdays or First Fridays devotions; fasting; the offering of alms; time spent in Eucharistic Adoration, etc. Spiritual Bouquets are given at special times, such as at Baptisms, First Communions, Confirmations, weddings, anniversaries, graduations, birthdays, Name Days, St. Valentine's Day, other feast days special to the recipient, etc., or when the recipient is going through trouble, such as sickness, depression, or mourning; or for no special reason at all. They can be made by or offered to individuals or groups -- for ex., the siblings of a family might make a spiritual bouquet for their sick Aunt, or an individual might make a spiritual bouquet for the women of her parish who are starting a new pro-life group. When a spiritual bouquet is made by a group, the individuals of that group might make their own, different sacrifices for the recipient, which makes for a very colorful bouquet indeed. We hope you'll feel better soon! in which I commit to pray for your intentions. and bless all that you do. See also the pages on Mass Intentions, Votive Offerings, and, more generally, Redemptive Suffering.